I don’t know about you guys, but when it comes to handicapping a race, the name of a horse is a huge factor for me. Even though I can read a program and tell you what each statistic means, and whose past performances are the best, the name still stands out above everything else on the page. Second to a horse’s name are its connections, whether or not I’ve ever talked to them or met them, what I remember about them, and whether I feel they deserve to win. While these bets don’t always make me a lot of money, it’s all the more exciting if the horse does well, because I’m genuinely happy for those directly connected to her. And, in general, betting on a horse that means something to you is a lot more fun. With that said, I’ve spent some time over the last week researching the meaning behind the names of some of this year’s Kentucky Oaks (gr. I) possible contenders so that you too may have some feeling behind your bet come April 30. I’ve also listed some fillies that were originally pointed toward to Oaks, but will now be taking another path this spring. Finally, I’ve also included each filly’s ranking (as of April 14) on the graded earnings list for the Oaks, which is limited to 14 starters. Please keep checking back, as I will continue adding fillies and updating this list as more information becomes available. Jody is the name of the wife of the filly’s former owner, Larry Lay of Jenna Lee Farms, who purchased her as a yearling. “Slew,” of course, derives from Jody Slew’s sire, Slew City Slew. Jody Slew has a record of 4-0-3 from 10 starts. She won this year’s Tiffany Lass Stakes and Silverbulletday Stakes (gr. III) at Fair Grounds. Harissa has a record of 2-2-1 from seven starts. She scored her big win last out in the March 28 Sunland Park Oaks. Sheer Beauty has a record of 3-0-3 from seven starts. 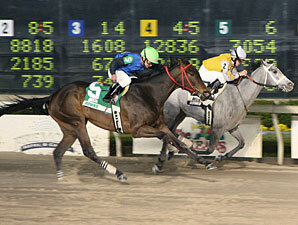 She won the Feb. 26 Green Oaks Stakes at Delta Downs and most recently ran third in the Fair Grounds Oaks. Greathouse noted how he’s used some of the other James Bond girls to name his horses in the past such as Honey Ryder, a two-time grade I winner and Kentucky champion on the grass, who was named after a fictional character in the 1962 Bond film Dr. Noe. Devil May Care, who has won three of five starts, most recently took the March 20 Bonnie Miss (gr. II). 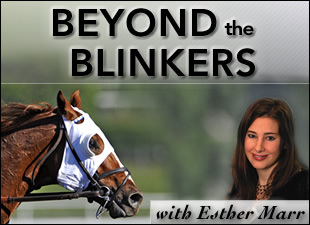 She turned in a bullet work at Palm Meadows training center April 11, covering four furlongs in :47.40. “(Amen Hallelujah) was born eight days before my son, Jake, who’s now 3 years old,” said Stan Whisenant, who co-owns the filly in the name of his Heath, Texas-based Whizway Farms with IEAH Stables. “My son was just getting to where he talked…he would say prayers with his mother at lunch and dinner, and while I was always taught that you just say ‘Amen’ at the end (of the prayer), for some reason, he started saying, ‘Amen Hallelujah!’ At the time, he was only a year and a half or 2 years old and pronounced it ‘Amen Hallewoowa! 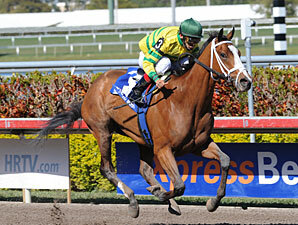 Amen Hallelujah, who has a record of 4-2-2 from nine starts, won the Jan. 16 Davona Dale Stakes (gr. II) at Gulfstream Park and the Santa Ynez (gr. II) at Santa Anita Park, and finished runner up to Devil May Care in the Bonnie Miss. While Beautician has won only once in eight starts, she has been second four times in graded company, including last year’s Grey Goose Breeders’ Cup Juvenile Fillies (gr. I) and Spinaway Stakes (gr. I). 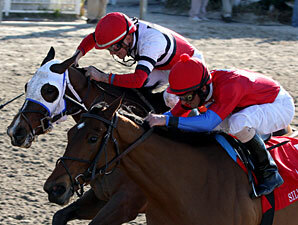 In spite of a disappointing eighth-place effort in the April 3 Ashland Stakes (gr. I), Beautician had a bullet work at Churchill April 13, when she covered four furlongs in :47 flat. Crisp is named after a term on workout sheets that describes impressive morning performances. Crisp has won three of five starts, including the Jan. 10 Santa Ysabel Stakes (gr. II) and March 6 Santa Anita Oaks (gr. I) last out at Santa Anita. The filly is named after Lexington-based owner Mark Stanley’s college-aged daughter Alex, whose temper has gotten sweeter with age. Stanley has named several of his fillies after Alex’s ever-changing disposition, including graded winners Swift Temper, Pleasant Temper, and Quick Temper. Quiet Temper, who has a record of 3-4-0 from eight starts, most recently won the Fair Grounds Oaks. Last year’s Juvenile Fillies victor She Be Wild (by Offlee Wild), currently ranks first with earnings of more than $1.3 million. 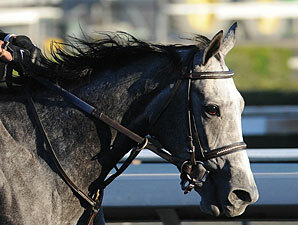 Blind Luck, a two-time grade I winner in 2009, who captured the Feb. 13 Las Virgenes (gr. I) at Santa Anita, ranks second on the list, with earnings of more than $1 million. She is by Pollard’s Vision out of the Best of Luck mare Lucky One. Evening Jewel, the surprise Ashland Stakes winner, ranks seventh on the list with earnings of $410,600. She is by Nothern Afleet--Jewel of the Night, by Giant’s Causeway. Sassy Image, by Broken Vow, out of the Hennessy mare Ideal Image, ranks ninth on the list with earnings of $312,184. 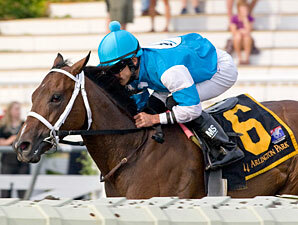 A two-time graded stakes winner at 2, she most recently captured the Jan. 17 Sweetest Chant Stakes at Gulfstream Park. Joanie’s Catch, who has had a seasoned career of 2-8-6 from 18 starts, has not won a race this year, but finished runner up in a trio of graded contests at Gulfstream Park. Currently ranking 10th on the graded earnings list with $374,790, She is by First Tour—Caught Speeding, by Saint Ballado. Christine Daae (named after a Phantom of the Opera character because of the white mask on her face), who broke her maiden by an eye catching 8 3/4 lengths in January, is now pointed toward the June 5 Acorn Stakes (gr. I) at Belmont Park, according to trainer Patrick Biancone. 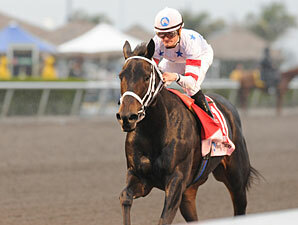 Diva Delite, a grade III winner this year at Tampa Bay Downs, is now slated for either the May 1 Eight Belles Stakes (gr. III) at Churchill or the Black-Eyed Susan Breeders’ Cup Stakes (gr. II) at Pimlico May 14, according to trainer Ian Wilkes.